ge solution that offers 9 x Thunderbolt 3 ports allowing connection to nine clients which are able to simultaneously edit, transfer and share data on PCIe RAID storage over Thunderbolt connection at unprecedented speeds. 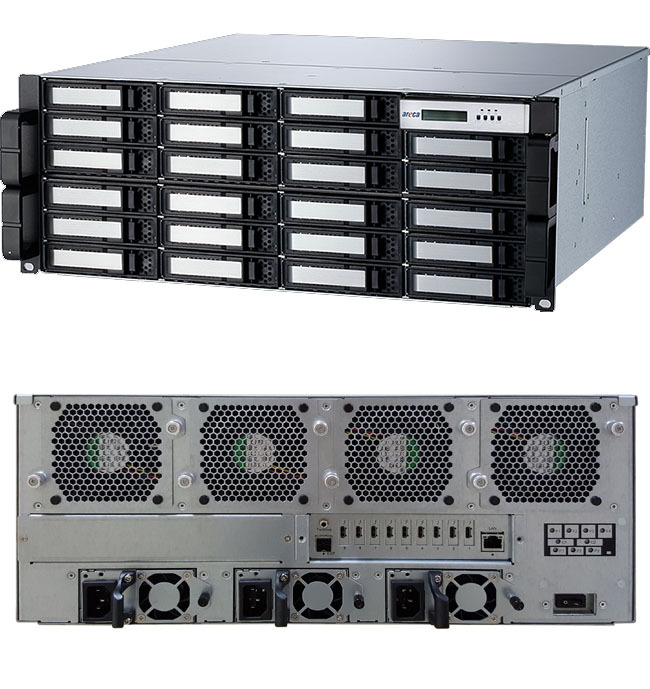 The reserved Mac mini caddy on 4U 24-bays enclosure is the best solution for adding one Mac mini server and computer to an ARC-8050T3 SAN rack chassis. ARC-8050T3 SAN leverages Thunderbolt interface and transforms it into a more flexible Thunderbolt SAN architecture and eliminates the high costs of Fibre Channel SAN or 10 Gigabit Ethernet. Thunderbolt� 3 brings Thunderbolt to USB-C at speeds up to 40 Gbps, creating one compact port that does it all � delivering the fastest, most versatile connection to any dock, display, or data device. 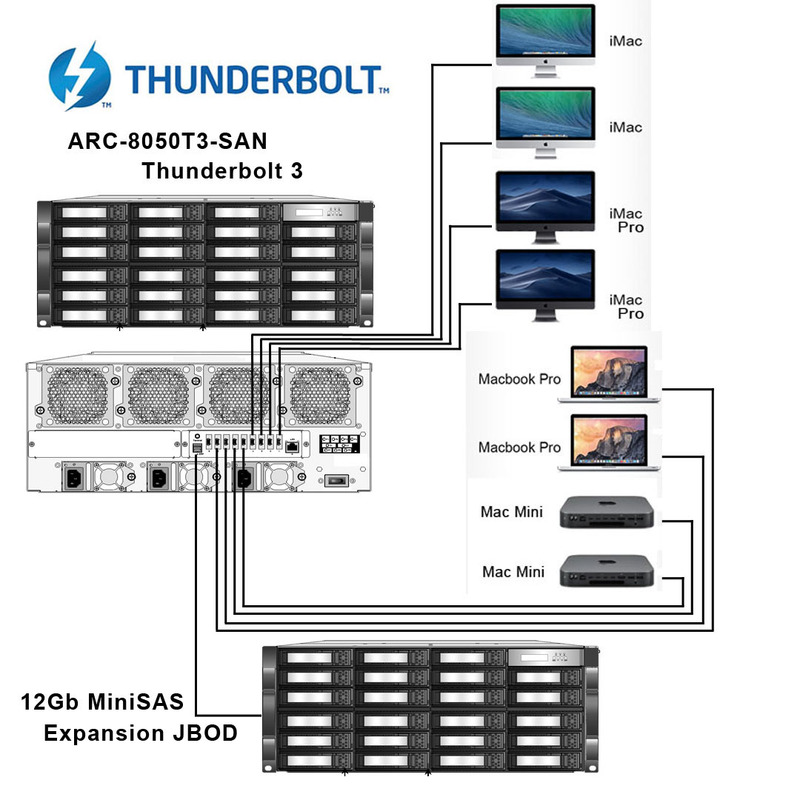 ARC-8050T3 SAN is a storage solution that offers 9 x Thunderbolt 3 ports allowing connection to nine clients which are able to simultaneously edit, transfer and share data on PCIe RAID storage over Thunderbolt connection at unprecedented speeds. The reserved Mac mini caddy on 4U 24-bays enclosure is the best solution for adding one Mac mini server and computer to an ARC-8050T3 SAN rack chassis. ARC-8050T3 SAN leverages Thunderbolt interface and transforms it into a more flexible Thunderbolt SAN architecture and eliminates the high costs of Fibre Channel SAN or 10 Gigabit Ethernet. The Apple�s Thunderbolt 3 (USB-C) to Thunderbolt 2 Adapter (sold separately) lets you connect Areca ARC-8050T3 solutions to any of the Mac with a Thunderbolt or Thunderbolt 2 port and macOS Sierra 10.12 or later. For more detail information and potential restrictions, please see Apple Support.